Thank you for being part of Weekend Caucus! How one small sports franchise had a big impact on marriage equality. Don't Be a Hypocrite. What Your Outrage About the Saudi Soccer Team Missed. Don't get too excited. The FBI Director has been hired by an autocrat, again, to do one thing and one thing only. What now for the NCAA when a repeal doesn't appeal? Newly-Emboldened Red States Be Warned: the NCAA Still Wants You to Play Nice. As March Madness kicks off, NCAA reaffirms commitment to LGBTQ community. Does Putting 'America First' Put America's Sporting Bids Last? 1994 offered promise; 2017 isolationism. Women Who Wear a Hijab Aren't in Need of Rescuing by Modernity, Just Some Better Running Gear. Nike: liberator, oppressor, or savvy marketer? Calls to boycott miss the point. 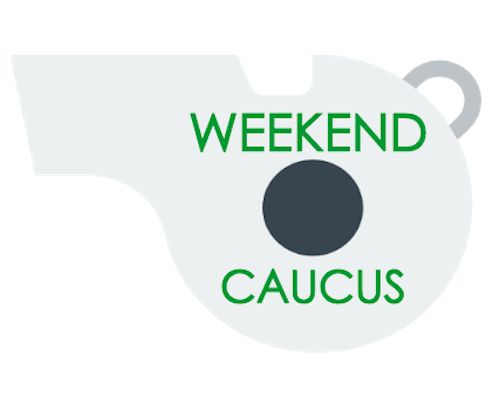 Weekend Caucus is the new constituency -- sports fans who want to go behind the scores, stats and standings to explore what it all says about our society. Pundits have always dumped bad political news on a Friday in the belief that nothing of consequence happens on the weekend, and no one is paying attention. Weekend Caucus is for the people who never stop paying attention. For those who believe what happens on the weekend means something; that the weekend is where politics, sport and culture intersect, and therein lies the key to understanding what is happening around us. Weekend Caucus was founded by Ed Coper and Jason Wojciechowski, two writers who had spent their lives covering the sport of politics. Weekend Caucus was born when they realized they'd prefer to be covering the politics of sport. With a background in advocacy campaigns, they realized the influence sports has over so many issues that need more attention, yet most sports coverage divorces the playing from the political. Writers for Weekend Caucus come from a diverse background with a range of interests and expertise, giving new perspectives on issues that inform our daily lives. Want to write for Weekend Caucus? Drop us a line. Weekend Caucus was incubated by Corelab. Sign up to be part of the Weekend Caucus community, with regular updates and special offers.